A newly-classified fossil gives clues to how life in the oceans recovered from a mass extinction about 250 million years ago. The reptile is an early relative of the ichthyosaurs - a large group of marine reptiles that swam at the time of the dinosaurs. With its tiny toothless head, the creature is something of a curiosity, say scientists. The specimen suggests marine reptiles evolved quickly after the event. Previous evidence has suggested it took a long time for animals in the seas to bounce back. Details of the specimen, Sclerocormus parviceps, are unveiled in Scientific Reports. Dr Nick Fraser, Keeper of Natural Sciences at National Museums Scotland, worked on the fossil alongside teams in the US and China. "Here's something that gives us a sense of the evolutionary pathway," said Dr Fraser. "We've still got a long way to go to see where the ichthyosaurs came from, however it's a step in the right direction. "And it all points to a very rapid radiation after this mass extinction - this mother of all extinctions at the end of the Permian, which had a major impact on the Earth." The ichthyosaurs are a large group of marine reptiles that were common in the Jurassic and the Cretaceous periods. Most were dolphin-like in shape with streamlined bodies and long snouts. But the new animal is something of a mystery, with its short snout, long, whip-like tail and thick ribcage. And while many ichthyosaurs had teeth for catching prey, Sclerocormus lacked teeth and probably sucked up food. "It looked a bit like a small-headed porpoise with a fairly broad stiff body," Dr Fraser told BBC News. The creature fills the gap in the fossil record between primitive marine reptiles and the more advanced ichthyosaurs, which dominated the oceans for millions of years. "We don't have many marine reptile fossils from this period, so this specimen is important because it suggests that there's diversity that hasn't been uncovered yet," said co-researcher Dr Olivier Rieppel of The Field Museum in Chicago. "These ichthyosauriforms (ichythyosaurs and close relatives) seem to have evolved very quickly, in short bursts of lots of change, in leaps and bounds." Prof Ryosuke Motani of the department of earth science at UC Davis also worked on the fossil. "Sclerocormus is one of the most surprising marine reptiles that I have seen," he explained. "Measuring 1.6 metres in total length it was one of the largest marine vertebrates of the time. "It appeared after the mass extinction, which was at the end of the Permian, and quickly became extinct." China's geology is ideal for finding the remains of marine reptiles from the ancient oceans. There have been a wealth of recent fossil discoveries inside quarries, including Sclerocormus, which has taken several years to classify. 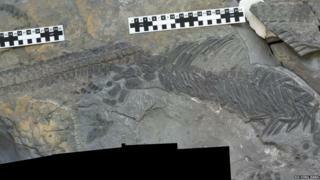 Earlier this month, some of the same researchers unveiled another marine reptile fossil, which was also found in China. Named Atopodentatus, it lived 242 million years ago and had a distinctive hammer-shaped skull.